The Finance Minister announced that the government was looking to honour the promise that BJP had made in their manifesto for the 2014 general elections – that of implementing the MS Swaminathan report. 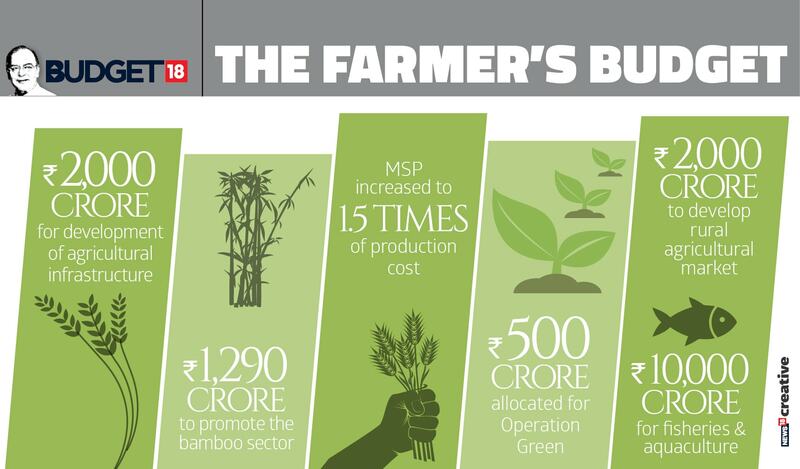 New Delhi: Devoting a significant portion of his Budget speech to the agriculture sector, Finance Minister Arun Jaitley on Thursday promised farmers a Minimum Support Price (MSP) that will be 1.5 times the production cost of their kharif crops. The Finance Minister announced that the government was looking to honour the promise that BJP had made in their manifesto for the 2014 general elections – that of implementing the MS Swaminathan report. Swaminathan in his report had recommended giving farmers "at least 50 percent more than the weighted average cost of production". Implementation of the Swaminathan Commission recommendations has been one of the key demands of protesting farmers who have been agitating throughout the country for the past several months. The Finance Minister also addressed the crucial and controversial issue that has pitched farmers and environmentalists, Union and state governments directly against each other – the crop burning issue. Jaitley promised the setting up of a consultative committee, in collaboration with concerned ministries, to find an in-situ solution to the crop burning issue. On the other, the big surprise announcement on Thursday was the reserving of Rs 10,000 crore each for fisheries and animal husbandry through Fishery & Aquaculture Development Fund and Animal Husbandry Fund. Jaitley also announced the expansion of electronically connected e-mandis through the government's eNAM project. He claimed that 470 mandis have already been connected through the network and the rest will be also be linked by March 2018. The Finance Minister further promised assistance to boost 'cluster farming'. "We will encourage women self-help groups to take up organic farming in clusters," Jaitley said. Cluster farming is the idea of farmers with smaller holdings (owing to arable lands being reduced to unprofitably shrinking size due to inheritance) coming together to work on each other's farms and share the profits equitably. This is being practised in parts of Maharashtra, Karnataka and Sikkim, however, it has really not picked up in a major way. A big boost to food processing units by doubling its budget from Rs 700 crore to Rs 1400 crore was also promised in the Union Budget 2017-18. Several farm leaders have been demanding more food processing units in order to increase production and minimise harvest losses.